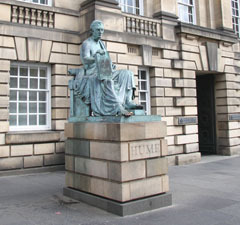 David Hume (1711–76), incongruously portrayed in this statue as an ancient Greek philosopher rather than a mid-eighteenth-century man of letters, is perhaps the best known figure of the Scottish Enlightenment. In the eighteenth century Edinburgh witnessed an unprecedented flowering of science, literature and philosophy. 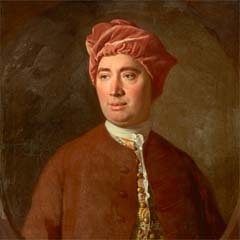 Hume was a contemporary of Adam Smith (1723–90), the great political economist, Adam Ferguson (1721–1816), the social theorist, Joseph Black (1727–99), the pioneering chemist and James Hutton (1726–97), the geologist. These figures all knew each other and socialised together in the convivial atmosphere of Edinburgh’s many clubs and hostelries. Together they helped develop many of the ideas and theories that made the modern world.